The connection of G15 is unique where no screw is involved. The joining is all done with a sliding action with slots on the 5 faces of G15. The slots are in different orientation so that you can slide the joints from different directions. 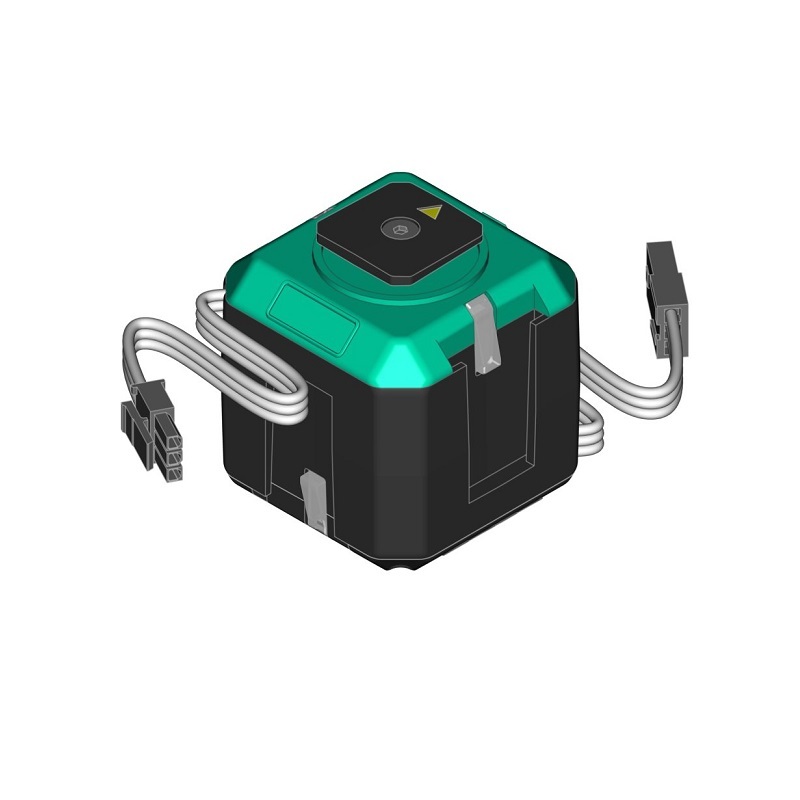 The G15 is specially designed in a cube form with the shaft at the center, combined with the sliding joint, enables you to assemble and dismantle your robot in a matter of minutes. In contrast with using screws, this would normally take hours just to build a single robot. When you receive your G15, the External Joint and Inter Connect should be connected to it. So, the first thing to do would be to remove these two joints. You can skip this step if you plan to test the motor first and remove the joints later. To remove the External Joint connected to the shaft, use a long and flat object(we are using a screw driver as example) to press on the lock of the joint. You can see clearly in this picture the location of the lock for the External Joint. While pressing, push the External Joint in the direction against the lock. Keep pushing until the joint comes off. You can see clearly in this picture the location of the lock for G15. The G15 shield converts UART duplex communication to half-duplex single line communication compatible for G15 Cube Servo. This basically means that the shield acts as a driver or converter for us to communicate easily with G15. For complete details on Cytron G15 Shield, you can refer to the user manual. We will be using Arduino Uno as an example, you can always choose other Arduino or compatible main board. For more info on using Arduino Uno, you can refer to Getting Started with Arduino Uno. First, download G15 Shield Arduino libraries and example code at the product page. Unzip the file and copy it over to your Arduino library folder. Plug your G15 to either one of the two ports on G15 shield. Connect the DC adapter or batteries to your main board. This is required as the power from USB is not sufficient. Finally connect your board to your PC or Laptop. Before you can proceed, you will have to set a unique ID for each G15 if you have more than one G15. The default ID from Cytron is ‘1’. You can set the ID as any number in between 0 – 253. The ID is a identification number assigned to each G15. This ID is used to identify each G15 on the communication network. Just like us, we have names to identify who we are, and G15 has ID to identify them. It’s as simple as that. If two of the G15 has the same ID, a communication collision may occur which result in error. If you are only using one G15, then you can skip this step. If you are using two G15, you do not have to change both the ID, changing either one will do, as long as they don’t have the same ID. Start Arduino IDE and open the G15 example under Examples > G15 > SetID. Please make sure that you are using the latest Arduino IDE (version 1.0.2 and above) because Arduino has modified their standard libraries which affects G15 libraries. Lets take a look at the code. This is to include the G15 library function. This means that we are defining G15 with ID ‘1’ as servo1. In other words, servo1 represents G15 with ID ‘1’ in the following codes. You will have to know the existing ID of the G15 before you can change it. Remember that the default ID is ‘1’. The 3 in this code means that the control pin on G15 shield is set to D3 as shown in the picture below. If you change the jumper here to D9, the 3 should be replaced with 9 instead. If not, just ignore it and follow the sample code. This is the setting initialization as shown in the comments. You can just skip this and follow the sample code. This is the code to change the ID. This means that we are changing the ID of servo1 to ‘2’. You can always set it to any number in between 0 – 253, just that in this sample, we are changing it to ‘2’. Upload the code, this should change the ID of your G15 to ‘2’. Now, you can label your G15 with the corresponding ID. Start Arduino IDE and open the G15 example under Examples > G15 > Positioning. This is defining the G15 as explained when we set the ID. You can add in this code with modification for additional motors, as shown below. For the second line, just ignore it as that is for Dynamixel AX12 which we are not using. servo1 is for G15 ID ‘1’, servo3 is for G15 ID ‘2’ and servo4 is or G15 ID ‘3’. You don’t have to follow the example using ‘servo’ as definition, you can use whatever name you prefer, such as cube1, handX, etc. This is the setting initialization as explained when we set the ID. You can just skip this and follow the sample code. This is the part where we make it move. You will notice that the only difference in the three lines is the value inside the bracket, that’s the position value. Change the value here to move the shaft to the position that you want. The value is between 0 to 1087. But how should I know what is the value for the position that i want? There is two triangle markers on the G15, one embossed on the body(we shall name it body mark) and one on the output shaft (we shall name it yellow mark). The yellow mark shows which direction the shaft is pointing and the body mark acts as a guiding point. When the two markers meet, the position value is 544 which is at 1800 as shown below. When the position value is set to 0, the yellow marker should move to 0⁰ as shown below. The resolution of each step is 0.33⁰. This means that if you increase the position value by 1, the shaft will turn 0.33⁰. Upload the code and you should be able to see the G15 in action! I have also changed the delay to 1600 as it would take a longer time for it to move from 0 to 1087. If the delay is too short, it will not reach the desired position. Play around with other position value and delay value, then observe the output. You will get the hang of it in no time. There is one more interesting function that you may like to test, turning on the LED. Copy the code as below into your code to turn on and turn off your LED. There is lots more interesting feature of G15 that you can test such as controlling the speed, the direction, changing mode and limiting the rotation angle. By now, your G15 should be moving. It’s time to make some movement with the joints. First of all, there is one little important thing that you should take note before you start connecting your G15. Do you still remember the yellow mark on the output shaft? Not only is it used to determine the position, it is also used as a indication of the sliding direction. the joints should slide in from the direction of the yellow mark. This only applies for the output shaft of G15, you can slide in any direction for the rest. Let’s move on to the other joints, I will just show you a few examples. For more details on the joints, you can always refer to G15’s User Manual. The External Joint is used to mount your G15 to any surface or object that does not have the sliding slots. The inter Connect acts as a block to connect 2 slots together. I’m using a scraped PCB as my base. I drilled 3 holes with 3mm diameter each and screwed the External Joint to it. The picture below shows the steps. To remove the joint, its almost similar with removing the External Joint, press on the lock using a long and flat object. While pressing, slowly push the U Joint in the direction against the lock. You will have to do it for both side to release the locks and remove the U Joint. how can we check the ID of G15 after set it?is that true that we just connect between arduino,shield and G15 cube to make a serial communication or there have other connection has to be done? You can check out another tutorial that we have developed. Does the power supplied to the servo include the USB cable 5v? Or do you need 7 to 12 additional volts to that 5v? Power supplied to the servo using G15 shield comes from Vin not 5V. Therefore, it is strongly advisable to provide 7-12V external power supply to Arduino board instead of 5V USB power only. means that need two power supply? 5v and 12v? to completed the overall system?